The vendor will pre-install a number of Microsoft apps and services on some of its tablets and phones -- and allow users to legally remove apps they don't want. Samsung both giveth and (allows users to) taketh away. The South Korean device maker is, for the first time, giving its customers access to Microsoft services and apps in its newest smartphones and tablets. At the same time, Samsung is allowing customers to strip away apps and bloatware they don't want on the company's newest phones. Recent posts on the XDA Developers Forum indicate that many pre-installed apps on the upcoming Galaxy S6 and Galaxy S6 Edge smartphones can be removed legally and easily. These apps include Gmail, Google + and YouTube; Samsung's own S Voice and S Health software; and Microsoft's OneNote, OneDrive and Skype, as reported by Forbes. 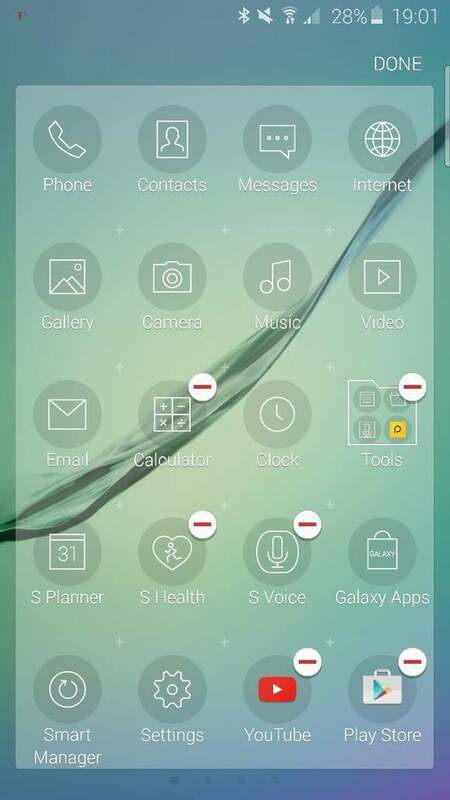 A user on the XDA Developer's Forum posted screen shots showing minus signs above app thumbnails, which apparently indicated those being removed. The ability to remove apps from the new smartphones could be a response to widespread criticism that Samsung devices have shipped with too much bloatware. Savvy users have been able to root their own phones to remove the apps, but doing so previously could void a device's warranty. Samsung was asked to comment on the developer postings and its intentions in authorizing the ability to remove apps, but didn't have an immediate response. Separately, Samsung announced Monday that it will pre-install Microsoft Word, Excel and PowerPoint, along with other Microsoft services, on some of its Android tablets before July (the company didn't specify which models). Those tablets will also get OneNote, OneDrive and Skype pre-installed. The company didn't specify which models would come with apps. However, at Mobile World Congress in early March, Samsung said that it was pre-installing a number of tools, including Microsoft's OneNote, OneDrive and Skype, on the Galaxy S6 and Galaxy S6 Edge smartphones, which go on sale April 10. Both phones also come with 100GB of free cloud storage for two years through OneDrive. At the same time, Samsung said it will offer Office 365 services on both phones to businesses when coupled with the Samsung Knox security service. Samsung said there will be three versions of Office 365: Business, Business Premium and Enterprise. A setup service for businesses will also be available. Samsung said the Office 365 services will be available on various devices, which apparently goes beyond just the two new smartphones. The expansion of Microsoft's software onto Samsung products fits into the overall Microsoft theme of "mobile-first, cloud-first." In a statement, Peggy Johnson, executive vice president of business development at Microsoft, says the new partnership with Samsung shows an attempt to "bring the best of Microsoft's productivity services to everyone, on every device -- so people can be productive wherever, however and whenever they want." Interestingly, Microsoft launched Office for iPad almost exactly a year ago.